KAHUTA (92 News) – PTI chairman Imran Khan has said that the ruling family has been caught in theft. Addressing a public meeting on Friday, he said that Nawaz Sharif destroyed the institutions in 30 years. “Nawaz always struck a deal with dacoits,” he added. He raised the slogan of ‘Gali Gali Mein Shor Hay, Sara Tabar Chor Hay’ (There is uproar in every street and the entire family is a thief). The PTI chairman said that the nation would not forget the JIT for its tremendous work. He said that he was visualizing a new Pakistan next week. Earlier in a message, Imran Khan has on Friday said that Prime Minister Nawaz Sharif has betrayed nation and malign his late father and children just to remain in power despite all loss of moral and legitimate authority. He said that it was shameful to see the prime minister refusing to resign despite proofs against him of money laundering, tax evasion, assets concealment plus perjury and forgery. The PTI chairman said: “How can nation’s taxpayers trust Nawaz Sharif, Finance Minister Ishaq Dar and their appointees like Security and Exchange Commission of Pakistan (SECP) chairman Zafar Hijazi and former National Bank chairman Saeed Ahmed who are all guilty of criminal financial wrongdoings. “What Nawaz Sharif calls conspiracy against him and democracy is actually his inability to subvert acc process by buying off all those holding him accountable,” Khan said. 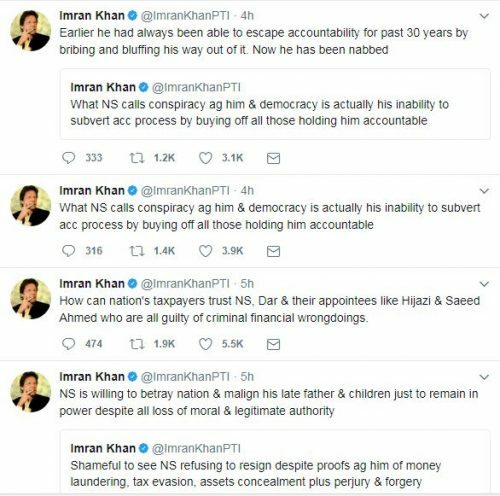 Khan went on to say that earlier he had always been able to escape accountability for past 30 years by bribing and bluffing his way out of it. Now he has been nabbed.